It returned nothing. The certificates should work, but they weren’t showing up. I checked the certificate inside of the Certificate Store. Inside the certificate’s properties on the “General” tab, there is a “Certificate purposes” group box. 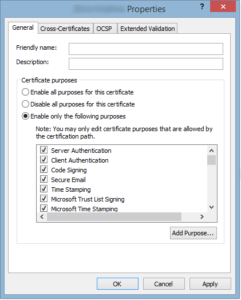 Inside of this “Enable all purposes for this certificate” was selected. Since that was not working, I selected “Enable only for the following purposes”. By default, all purposes were already checked. I clicked “Ok” and ran the Get-ChildItem command again and the certificate was finally listed. I ran through the signing process successfully. The signature on the PowerShell file was trusted and valid.